We’ve been back for a few days, but are just getting some time to reflect/catch up now that we are snowed in for the next few days thanks to this “nemo” storm we’re experiencing in MA right now (there’s a driving ban, so we couldn’t go anywhere even if we wanted to!). TEXAS has more TINY going on than one might think, considering it’s the state known for the slogan, “Everything is Bigger…”. 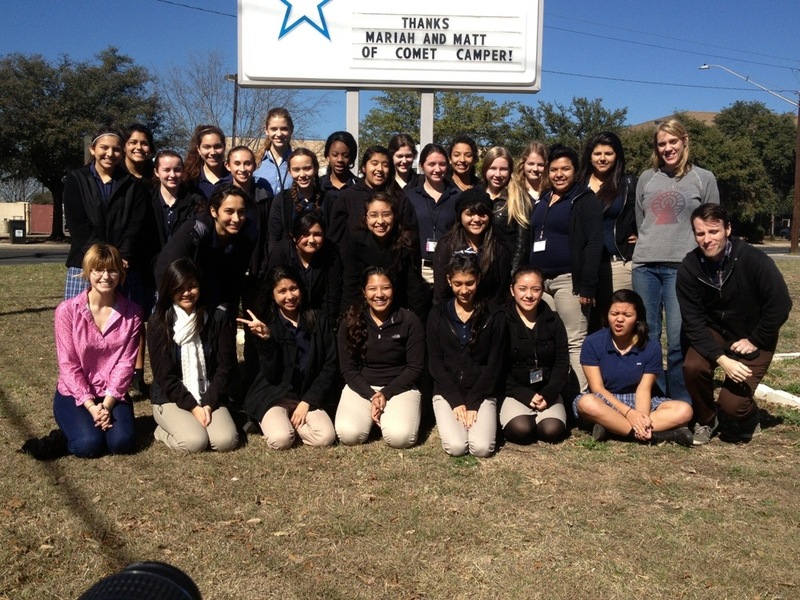 We had an incredible, inspiring time hanging out with the Engineering class at the Ann Richards School in Austin. Those girls are the coolest: they love math and science, the love engineering, and they were wise beyond their years. They were so engaged with their Project Ventura, they came in on Saturday and every day after school. I was super inspired by the work these girls were doing. We learned a lot from each other! You can all go check out their blog: http://projectventura.wordpress.com/. AND, you can help them out because their KICKSTARTER has just LAUNCHED! Please, please, please support these awesome girls by donating if you possibly can – they are the next generation of great innovators. I’ll keep reminding you throughout their campaign, but why wait? Go to their project page now, and donate some $! Me (in the pink shirt), Matt on the other side, with the ARS class. In a moment of wonderful fulfillment of life-goals and awesomeness, I also got to talk extensively to the ARS AP Environmental class about radical menstruation (a topic some of you will not be surprised to learn I am very well-versed in and passionate about). It’s an all-girls school, so they were all interested, and they asked! It was the highlight of my life – at least for that moment. I think I had a lot of those moments with the ARS girls. But seriously, I hardly ever get a chance to change awesome young ladies’ lives, but by the end of that talk no one was going to use a tampon again! I digress! While in TX, we also visited some other inspirational tiny house innovators. We hung out with Brad Kittel at Tiny Texas Houses for more than a few hours, which was wonderful. I filmed a great interview with this visionary man, so once that’s all edited you guys can see it. We also interviewed Garrett Finney – designer of the Cricket Trailer – a personal inspiration to me and the COMET. Right in Austin city limits, we visited and spoke with Tracen Gardner, the man behind the modular tiny house company Reclaimed Space. We’re working on editing all these interviews/tours now, hopefully they will be ready soon-ish! Tiny is becoming a big deal in Texas – and these are just a few of the leaders of this movement for smarter buildings.